"lower concourse commuter level." The drawing doesn't show any. Exactly. *Add to the absurdity the fact the MSG is in all likelyhood going to move within a decade and the 100-yr Hudson river tunnels are in desparate need of expensive maintenance in addition to the need for new tunnels. The center glass structure makes this building. *It is very similar to the bullet train station in Avignon, France. You're right, tonyo; the similarities are unmistakable. The connection is there - the west end concourse will be part of the lower concourse commuter level. *The 8th Ave subway line will be closest to this point. *I have a more detailed drawing somewhere, maybe I'll find it and scan it. I thought of this the other day, and I think that this is only appropriate. NEW YORK (Reuters) - The new railroad hub planned to replace New York's aging Pennsylvania Station will be named in honor of the late U.S. Sen. Daniel Patrick Moynihan, New York officials said on Thursday. Governor George Pataki and Mayor Michael Bloomberg said the station, scheduled to open in 2008, would be named the Daniel Patrick Moynihan Station, in memory of the four-term Democratic senator who died on Wednesday at 76. Moynihan was a driving force behind the new station, to be built in the stately James A. Farley Post Office Building above the current Penn Station tracks. He had served since last year as the mayor's representative to the redevelopment corporation directing the project. "His passion for public works and public spaces reminded us that great things can and must happen," Pataki and Bloomberg said in a joint statement, adding that Moynihan longed to use the Farley building "so that New York's entryway could be as grand as the skyline that surrounds it." The Empire State Development Corporation, future owner of the building, is in final negotiations with the U.S. Postal Service to purchase the building, expected to be completed this summer. Currently, Pennsylvania Station is the busiest passenger transportation facility in the United States, handling more than 600,000 people daily -- more than all three of New York's airports combined. The new station will increase Pennsylvania Station passenger capacity by 30 percent. The late Daniel Patrick Moynihan's legacy of tending to the nation's public works included the planned new Pennsylvania Station -- a train hub that will be renamed in his honor, officials announced Thursday. The retired Democratic senator was "the driving force" behind transforming America's busiest passenger transportation facility, Gov. George Pataki and Mayor Michael Bloomberg said in a joint statement. The 76-year-old Moynihan died Wednesday from complications stemming from a ruptured appendix. The new beaux-arts station, scheduled for opening in 2008, will be renamed the Daniel Patrick Moynihan Station. Over the years, he was the leading advocate of transforming the General Post Office in the landmark James Farley Post Office building into a modern transit terminal that would replace the station now serving about 600,000 travelers each day. Last August, Moynihan was appointed to the board overseeing the plans. The neoclassical, 1.4-million-square-foot Farley building sits across Eighth Avenue from the existing Penn Station. The project was first launched in 1999, but amid budget problems, the Postal Board froze capital spending for the Penn-Farley renovation. Then, after the World Trade Center attack, the Postal Service said it might need to keep its space at the Farley building due to damage at a post office near the twin towers. But in October _ at a press conference attended by Moynihan _ officials announced a deal in which the state would buy the post office and convert it into a transportation hub. Purchase of the building is expected to be completed this summer. Bloomberg has said that the existing Penn Station cannot handle the volume of passengers, and that it represents a national security issue after the Sept. 11 attacks grounded commercial airlines. The redevelopment will increase the station's passenger capacity by 30 percent and double the circulation space serving Amtrak, commuter and subway access, as well as buses and taxis. "For years, Moynihan tried to get the Postal Service out of the Farley building so that New York's entryway could be as grand as the skyline that surrounds it," said the mayor and the governor. 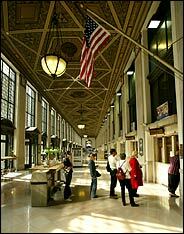 In addition to renaming the station, the Pennsylvania Station Redevelopment Corp. will change its name to the Moynihan Station Redevelopment Corp.
A resolution proposing the new names will be introduced to the Empire State Development Corp., the state agency which is coordinating the funding, management and execution of the project. I missed your reply earlier. Thanks. It makes more sense now. The naming of the new station for Moynihan is a fitting tribute. A dedicated public official like him only comes around once in a while. Then that can finally end the confusion of Newark's "Penn" station. *I think Baltimore's is Penn station as well. And while they're at it, they can rename Newark - Liberty or something. Add to the confusion that there are many people whose first language isn't English have trouble distinguishing "Newark" from "New York". *I've seen it countless times, people assuring foreigners "no no, you want Penn Station New York, not New Ark. *Stay on the train, it's the last stop." "One-way to Penn Station, please"
"Newark or New York, sir?" In his first term he teamed with Jacob K. Javits, his Republican colleague, to pass legislation guaranteeing $2 billion worth of New York City obligations at a time when the city faced bankruptcy. . . . * in 1991 and 1992, he successfully pushed to shift highway financing toward mass transit—and get New York $5 billion in retroactive reimbursement for building the New York State Thruway. . . .
Long before he came to the Senate, and until he left, he was building a monument of bricks and marble by making Washington's Pennsylvania Avenue, a dingy street where he came to work for President John F. Kennedy in 1961, into the grand avenue that George Washington foresaw. . . . Wherever he went, Mr. Moynihan explored interesting buildings and worked to preserve architectural distinction, from converting the main post office in Manhattan into the new Pennsylvania Station, to the Customs House at Battery Park and all around Washington. *Last year, over lunch and a martini at Washington's Hotel Monaco, an 1842 Robert Mills building that was once the city's main post office, he recalled how he had helped rescue it from decline into a shooting gallery. . . .
Mr. Moynihan's childhood has been pseudo-glamorized by references to an upbringing in Hell's Kitchen, which in fact he encountered after his mother bought a bar there when he was 20. . . . *Mr. Moynihan's mother, Margaret Moynihan, moved the family, including a brother, Michael, and a sister, Ellen, into a succession of Manhattan apartments, and Pat shined shoes in Times Square. *In 1943 he graduated first in his class at Benjamin Franklin High School in East Harlem. . . . Senator Kennedy, the legislative lion, once described him in 1993 as an exemplar "of what the Founding Fathers thought the Senate would be about," because of the New Yorker's breadth of interests, "having read history, and thought about it, and being opinionated." Neither Snow Nor Rain, but G.O.P. Service continues around the clock in the lobby of the Farley Post Office, a New York fixture since 1914. It has taken more than a decade, but the United States Postal Service and the General Post Office in New York City are finally about to part company. In fact, seemingly overnight, most of the building is already empty. That is because the president is coming to town. 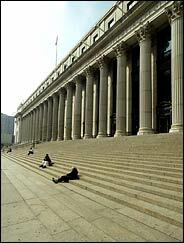 The late Senator Daniel Patrick Moynihan worked for years to transform the grand old building at Eighth Avenue and 33rd Street into a train station, but even after securing federal, state and city cooperation, no one could pin down the Postal Service on an exit date, said Kevin Sheekey, Mr. Moynihan's former chief of staff. Then the Republican National Committee chose New York City for its national convention. Mr. Sheekey, who went on to work for Mayor Michael R. Bloomberg and now coordinates convention preparations for City Hall, saw a dual opportunity in the post office building: Use it as a media center for the 15,000 journalists who will cover the convention, and use the convention as a wedge to get the post office out. And so after the post office leaves, the news media will move in. And sometime after the convention ends, in early September 2004 and once the Empire State Development Corporation actually owns the building, construction on the train station is expected to begin, a state official said. Negotiations between the state and the postal service are continuing. It is a switch for a building, renamed in 1982 after Postmaster General James A. Farley, that has never once shut its doors since it opened in 1914, a postal official said. It is the only retail postal operation in New York that is open 24 hours a day, seven days a week, the place last-minute tax filers can always count on to get their papers in. The place where 71 years ago postal workers started Operation Santa by raising money to provide gifts for children who sent their requests to the North Pole. With such close ties to the building, some postal employees become a touch defensive, insisting that they are not really leaving, just scaling back. They will, for example, maintain some mail services there, like the retail windows, which will remain open around the clock, a postal official said. At the moment, carriers continue to pick up mail there as well. Nevertheless, most of the 1.56 million square feet once occupied by the post office will be vacated. Much of the work, like the sorting of mail, has already been parceled out to other postal centers, said Anthony Musso, a spokesman for the postal service. "I have 31 years in the postal service, born and raised in New York, started my career at Kennedy Airport, and to me, this was always the post office," Mr. Musso said as he walked around the ornate lobby on Eighth Avenue. "I never thought of headquarters in Washington." When the building opened on Labor Day, 1914, it was hailed for its architectural splendor, its unparalleled work space and the mahogany offices afforded to the postmaster and his staff. "Its walls are of handsome Botticino marble, decorated with ornamental ironwork," read an article that appeared on Sept. 6, 1914, in The New York Times. The building was a marvel at the time. Besides its huge size (even before an addition was built in 1935), it was linked to a system of pneumatic tubes that blasted mail beneath New York City's streets. The tubes, with enough pressure to send a container carrying up to 700 letters nearly 30 miles an hour, ran in a loop around much of Manhattan, with an extension into Brooklyn. But as manual work gave way to mechanized work, and then to automation, the need for such a huge space in the middle of Manhattan faded. So, apparently, did the state of the building. The front is gleaming today, with 70 retail windows running its length, restored Works Progress Administration-era murals, shiny brass tables and fabulous coats of arms on the ceiling. But in the bathrooms, for example, there are signs that warn against drinking the water. The pipes are that bad. The artifacts of postal past were barely preserved. The pneumatic tubes were walled off years ago. Roll-top desks were discarded. No one seems to know where the old pneumatic canisters are. A postal inspector has spent the last five or six years trying to track one down on his own time for posterity. When one retired postal worker, Paul Konigsberg, 62, and others decided to create a postal museum, they could not forage in the storage room, because there really was none. Today there is a small room, off the lobby, with a few glass showcases and a sign propped up on two cabinets that says "Museum of Postal Service." Everything inside was purchased online, Mr. Konigsberg said. He raised the money by selling old postal badges that were turned into money clips. Asked if he had anything in the display that was actually from the building, Mr. Konigsberg put his hand to his head, swooned a bit and said, "Oh, boy." Meaning the answer was no. Upstairs, Mr. Konigsberg has set up an office in what looks like an old storeroom. Old dusty mail carts, like industrial laundry baskets, are piled high with tools of the trade, including scales, pins, badges and framed pictures. A poster on the wall bears a faded black-and-white picture of employees in the building who once formed a marching band. It offered for sale sheet music to "The Letter Carrier Song" and "The Letter Carrier Waltz." There is a bowling trophy from 1954-55 for players in the National Association Postal Supervisors league. There is even a little scrapbook someone started keeping on Dec. 1, 1874. One of the first clippings is an obituary headlined "The Eventful Life of the Oldest Employee in the Post Office." Ask Mr. Konigsberg about his memories of the building, and he immediately talks about the swing room. The name is a little misleading. It was where postal workers used to wait between shifts. "There weren't enough chairs," he said. "There weren't any tables. There were bodies falling all over each other. The only food was in machines if you were crazy enough to buy it." "Conditions may have been horrible, but we enjoyed working together," he said. "It was a happy family. It's not the same today." Everything does seem to be changing at the Farley building. In the era after anthrax and Sept. 11, it is nearly impossible to tour the fortresslike structure. There are huge empty spaces upstairs and downstairs, but no one is allowed in without authorization, officials said. There is also the matter of the Republicans. The building's namesake, Mr. Farley, was a die-hard Democrat. He was a key political figure in the administration of President Franklin D. Roosevelt, served as chairman of the New York State Democratic Party for 14 years and attended every Democratic convention from 1924 until his death in 1976. "I am sure he wouldn't be happy about the Republicans' coming," said Mr. Farley's grandson, James A. Farley 3rd. "He wouldn't be happy about the Republicans doing much of anything. But what are you going to do?" The front of the building, on Eighth Avenue. 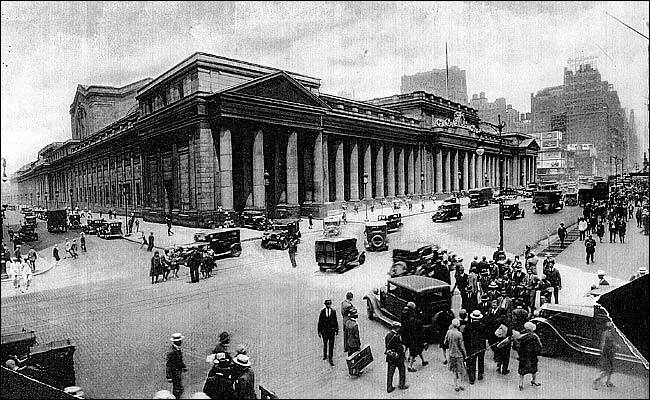 The facade of the exuberantly oversized Penn Station had 84 granite columns. Forty years ago on Tuesday, jackhammers began demolishing New York's original Pennsylvania Station, an exuberantly oversized 1910 railroad station that swept travelers and commuters along through a series of ever more spectacular public spaces. A facade lined by 84 massive pink granite columns led those in taxis into a carriageway derived from the Brandenburg Gate, while those on foot traversed a long, coolly elegant, light-drenched Italian-style shopping arcade. Then came a waiting room a block and a half long and 15 stories high that was modeled on, but larger than, an imperial Roman bathhouse. These details, vividly described in Lorraine B. Diehl's book "The Late, Great Pennsylvania Station'' (Houghton Mifflin, 1985), were just the warm-ups, the canapés for the great concourse behind, a room whose complex, extravagantly curved and sinuously arching steel-and-glass-greenhouse roof high overhead brought bright daylight down to platforms and tracks deep in the Manhattan bedrock 45 feet below street level. Even now, 40 years after its disappearance, people can still remember the multilayered effect this room had, the glimpses of destinations no trains could reach. Hurrying about on everyday business, people could at the same time feel singled out. Entering the concourse was somehow like boarding a see-through dirigible that was about to float away, or like a stroll across a forest floor beneath gigantic transparent orchids. And all this just to get on a train! No wonder two generations of New Yorkers took this station to their hearts and felt betrayed by its loss. At the time there was nothing to be done to stop the destruction; the city didn't yet have a Landmarks Preservation Commission. Traditionally, New York had defined itself as the House That Ruthlessness Built, and for more than 300 years the conveniently prevailing assumption had been that whatever got torn down was only making way for something better. No one, after all, had protested in 1903 when 500 buildings had been razed so that Penn Station could go up. This week, a new organization called the New York Preservation Archive Project has reassembled and is honoring the small band of then-young architects, writers and concerned citizens who rose up in the early 60's to object, strenuously and eloquently, to the demolition of the great Prussian-Italian-Roman-Jules Vernian train station. It's generally acknowledged that their efforts, together with the quieter, longstanding work of neighborhood groups in Greenwich Village and Brooklyn Heights, helped secure the creation of the city's Landmarks Commission in 1965. Thirteen years later, in 1978, the legality of landmarking was ringingly upheld when the United States Supreme Court ruled that the commission had acted properly in 1969 by forbidding the destruction of New York's other superlative train station, Grand Central Terminal. Today the Landmarks Preservation Commission has officially protected 1,100 individual landmarks, including the Empire State Building, Central Park and, more recently, Erasmus Hall High School in Brooklyn. It has also set up 81 historic districts in all five boroughs, including Cobble Hill in Brooklyn; Jackson Heights, Queens; and, in Manhattan, SoHo, the Upper East Side and, recently, the Gansevoort Meat Market. And there is more to celebrate. Anthony C. Wood, founder and chairman of the Preservation Archive Project, said that when landmarking became official, so did hope. "It's not routine or easy," Mr. Wood said. "You still have to fight madly, but now it's not inevitable that some beloved building is programmed to be lost." Thanks to the Penn Station protestors and other preservation pioneers throughout the city, the way change comes to New York has been transformed. Most of New York's buildings are still destined to be short-lived, at the mercy of whims and impatience and sudden changes in investment strategies. We all indelibly learned in September 2001 that hatred can change the skyline in an hour. But within the blur of constant change we've been able to set up a pattern of permanency, and are now anchored by the places we can count on. Which means that when we look along Lexington Avenue, for instance, and admire the way the early morning sun turns the silvery Chrysler Building spire to gold, we can also look ahead to mornings long after our own time when others will be moved by the same sight. All this has happened because around the time that the old Penn Station was being torn apart, something was evolving within New Yorkers. People had begun to love the city for what it already made available rather than for what it might eventually become. In that moment, New Yorkers found a new bedrock inside themselves, and that's not likely to change. Tony Hiss's works include "The Experience of Place'' and, with Rogers E. M. Whitaker, "All Aboard With E. M. Frimbo.'' His next book, "From Place to Place,'' to be published by Knopf, is about exploring the travel experience. To mark the 40th anniversary of the day the first wrecking ball struck Penn Station, the New York Preservation Archive Project, a nonprofit group, has been trying to contact everyone involved in efforts to save the station. The group has identified 300 people who marched, wrote letters, signed newspaper ads or spoke at hearings. Anthony C. Wood, the group's director, believes that at least 65 of them have died, but his group hopes to contact 100 others, and at least 20 will be honored Tuesday at an event at the Century Association. The group plans to take oral histories from them at that time. Here are recollections of three original protesters. The architect Robert Venturi, the 1991 winner of the Pritzker Architecture Prize, loved the old Pennsylvania Station. When he was 5 or 6, his father used to take him to a spot overlooking the famous hall based on the Roman Baths of Caracalla. "That was it, my whammo introduction to the great Penn Station," he said. Mr. Venturi, now 78, calls the building, "one of the great interior spaces in the history of the continent." He was part of the small group that picketed outside Penn Station on Aug. 2, 1962, and he spoke at a City Planning Commission hearing on the station's fate in January 1963. Jane Jacobs's landmark book, "The Death and Life of Great American Cities," had been out for a year when she joined some 200 protesters on the steps of Pennsylvania Station that August day in 1962. The book's central theme of preserving what makes a city unique, including one-of-a-kind places like Penn Station, had caught on with many readers, she said, "but it hadn't yet caught on with planners and city officials." "There was no exhilaration to this kind of thing," Ms. Jacobs, 87, said of the protest. "It was more like a wake. The city was making everyone's life absurd with its goofy decisions." In 1962, when Laurel Lovrek of Cleveland was a freshman at Cooper Union School of Architecture, an early assignment was to go to Pennsylvania Station with her fellow students and draw what she saw. "In the brief time I was in the building, I really fell in love with it," said Ms. Lovrek, an architect who lives in Princeton, N.J. "It was the way trains used to be in those old black-and-white movies." She joined the picketers because a professor had told her to go. "I felt pretty good about what I was doing,'' she said, "but I remember we were ignored by the general traffic on the streets of the city that day."